Tree borers make a small hole in a tree. At the end of it, they chew on wood to elongate the tunnel. They digest food and grow. All this takes oxygen. The entrance to the tunnel is generally small. Some borers plug the entrance. Even without that, air circulation must be non-existent. How do they breathe? It just seems off hand that tree borers might be an extreme case. But I have the same question about all kinds of burrows. How do worms do it? Rodents? Ants? Do burrowers have any special behaviors or adaptations to help them cope? Thank you all for your answers and comments. But I suspect there is more to it than that. I doubt enough oxygen diffuses down the length of the burrow to keep an insect alive under bark. A tree died in my yard recently. 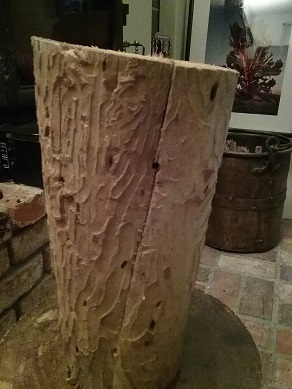 The bark now comes off easily. 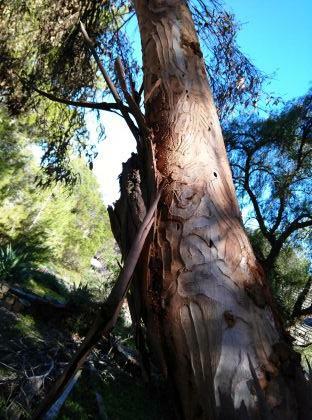 When a tree is stressed or diseased, insect often attack. They finish off the tree if the original problem doesn't. Clearly that has happened here. They have eaten almost the entire layer under the bark. 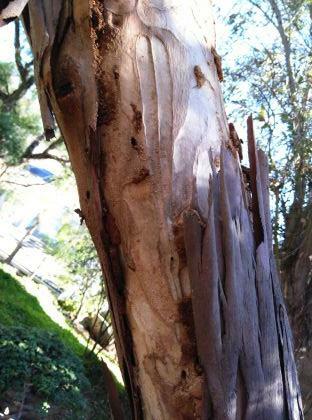 No wonder the bark is peeling off. 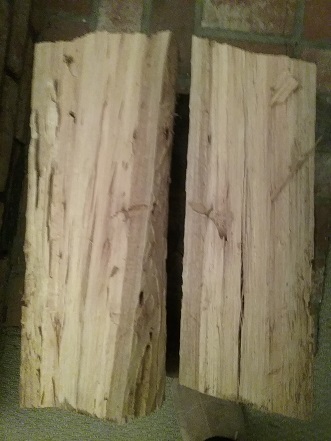 There is almost nothing left of the wood it was attached to. Most of the burrows are long and narrow. 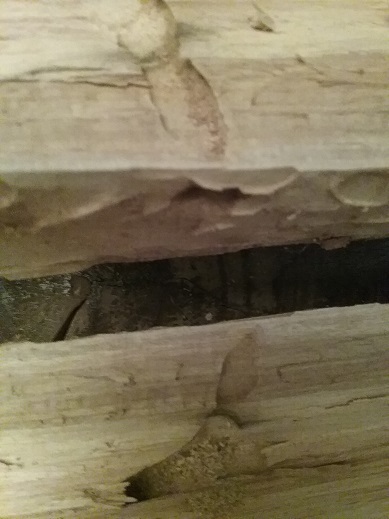 The insects carefully leave a small strip of wood between adjacent tunnels. Here is a close up of two burrows from the bottom of the previous picture. It was taken before I pulled off all the bark. You can see they started at the bottom, and grew as they climbed. 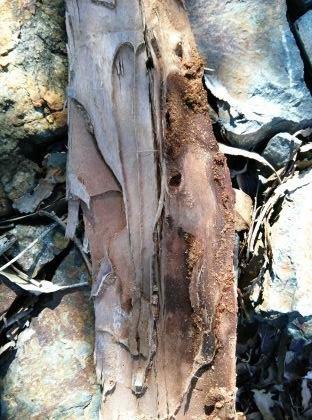 Here is the bark that covered the burrows. When insects chew the wood, the wood does not disappear. At the bottom you can see a portion of the sawdust that packed the burrow. Most of it fell out when I peeled off the bark. I have seen other pieces of bark where it clearly filled the entire burrow. At the top, you can see the holes where they dug out. Now that the tree is dead, the bark is falling off. But it wasn't when they started. Trees do not make it easy for insects to eat them. I expect the bark was well attached. I doubt it was porous enough for air to penetrate. I doubt there was damage, such as the long crack you can see along one burrow. Sometimes wood can be surprisingly porous. You can literally blow smoke lengthwise through a plank of red oak. But that is cut and dried wood. Live wood is full of sap. I expect that insects do not make holes in the tunnel. They make it hard for predators to get it. And yet enough oxygen does get in. A year later, I still think about this off and on. While having a small mass reduces oxygen needs, oxygen is needed to chew a tunnel in wood and grow. I cannot believe that enough oxygen diffuses down a long narrow tunnel packed solid with sawdust. Here is a photo from when I burned a log from the tree. You can see the surface is covered with burrows. There are also holes into the interior. Here I have split the log. You can see the holes continue deep into the tree and lead to chambers. These burrows are almost entirely free of sawdust. Here is a detail view. I expect they are kept clear because insects need to crawl down them. One reason would be they need air. Yet the surface burrows are packed. It seems likely an insect that can chew tunnels in wood can poke holes in bark. Does anyone know if they do this? Your question focuses mostly on insects, but there are cases of special adaptations by larger burrowing animals. The naked mole rat has a special kind of hemoglobin, and is also capable of surviving for about 10-20 minutes without any oxygen at all by switching from glucose metabolism to fructose. As the body mass of an organism decreases, their volume decreases with direct proportionality, so their metabolic needs are also reduced. The result is that small organisms like worms and insects have a much larger surface area to body mass ratio, which lets them passively transfer oxygen into their bodies much more easily. I am by no means an entomologist but most species of insects are able to exchange gases with the environment without any active respiration at all. Due to their small size, gases can passively diffuse through the trachea and spiracles directly to their internal fluids/muscles. That said, insects simply have much much lower basal metabolic rates compared to even small vertebrates. Lower metabolic rates mean lower oxygen needs, so that's why its not uncommon to see insects surviving in cracks and crevices that don't have a lot of air circulation. The little air circulation that does occur in the temperatures that insects thrive in is more than enough to support their oxygen needs. Not the answer you're looking for? Browse other questions tagged entomology ecology behaviour breathing respiration or ask your own question. How do ants get oxygen in deep colonies?